I love it! This painting of a sudden moment! Great piece, Jane - beautiful design, too - and I know the feeling of being caught in a sudden rain! The perfect title for this painting, Jane!!! I love her pose ....you can feel the rain coming down and how she's trying to avoid it..... Nice work!!!! I hope you put a frame on this, Jane! It is simply beautiful!! Very spontaneous and cool Painting! J'aime trop cette ambiance jaune doré contre le gris plombé, cela avec les traits du vêtement blanc donne à la jeune, dedans l'ensemble, une image comme d'apparition virginale. 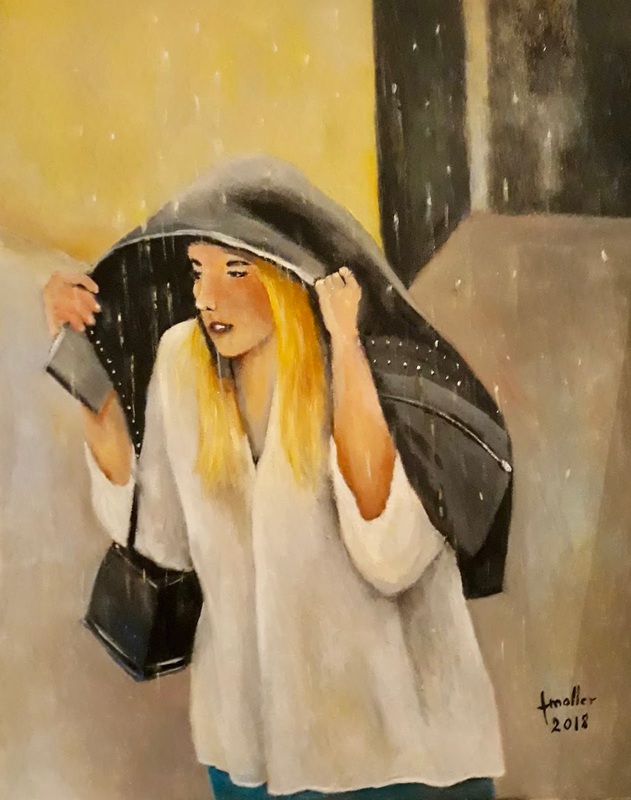 Jane - you can certainly feel the rain in this beautiful piece. I love the action you captured here. As always it is such a pleasure to see your lovely art. Hugs! This is what our weather will look like later today. I think a lot of us can empathize with being suddenly caught in a downpour! Used to happen a lot to me when we lived in the Pacific Northwest. I love her face!